Description: 1492nd-FREEING THE FIELDGUARD -ENIGMA TREE is a terrifying point and click type new escape game developed by ENA Game Studio. In the previous level you got a Diamond from the fairy. Now you have to fix the diamond on Field guard to bring him back to life, he will help you further in levels. 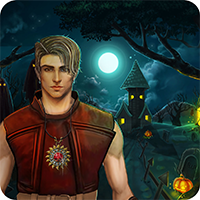 Find necessary objects, solve the clues and puzzles to rescue the Field guard. Break anything that comes in your way, keep playing ENA games.